After crossing the equator we sampled a series of stations in the southern hemisphere to find out what is going on in the Southern Gyre. A gyre is a swirling vortex, which in the ocean is created by wind or currents. There are two main gyres in the Atlantic Ocean, which are created by currents. The Northern Gyre circulates clockwise and is created by the North Equatorial and North Atlantic currents. The Southern Gyre swirls anti-clockwise and is created by the South Equatorial and Antarctic Circumpolar currents. These cyclonic gyres are like deserts on land that exist at the same latitudes – they are warm, low in nutrients and, compared to shelf seas and upwelling regions, are void of life. These two gyres have distinct biological, chemical and physical properties. The Southern Gyre, which is larger, is more productive fixing on average 2.86 Gt carbon per year, compared to 1.12 Gt carbon fixed by the Northern Gyre. In theory, the Southern Ocean can potentially rain down more particles from the upper ocean to the deep ocean, which sustain the fish and crustaceans that dwell in the deep. 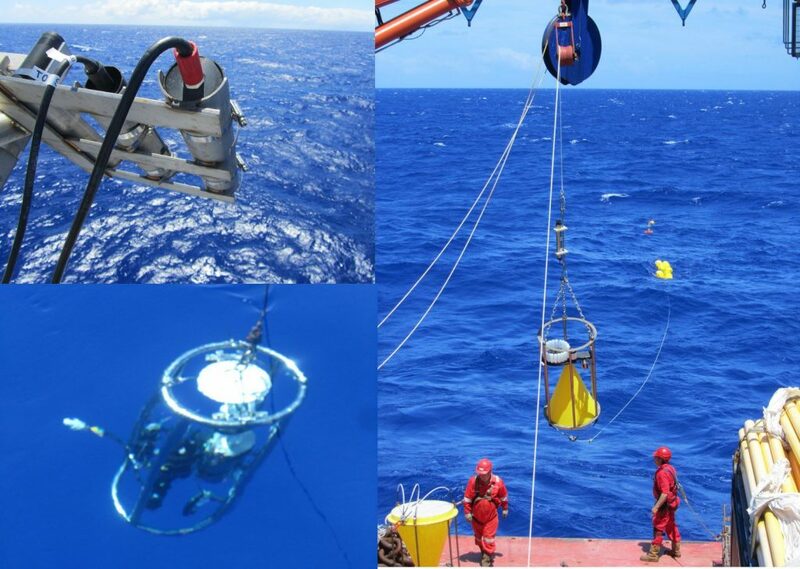 One of the activities of the Atlantic Meridional Transect, as part of its 20-year time series, is to deploy and recover sediment traps in the centre of both gyres. These sediment traps are large 2 m-high, yellow conical funnels. They are suspended around 100 m from the ocean floor and 3500 m from the upper ocean to capture material that sinks down from the surface – the crumbs from the banquet table that is the sunlit ocean. A rotating carousel loaded with bottles at the base of the funnel captures the sediment each month for the duration of one year. Despite the higher productivity in the Southern Ocean, the mixed layer and phytoplankton biomass in the Southern Gyre are deeper and reside at between 90 and 130 m, respectively. This makes these waters clear and a rich deep aqua blue. The water is more oligotrophic and there is less phytoplankton biomass, which is dominated by the smaller sized pico-phytoplankton (0.2 to 2 µm in diameter). Deploying the optics rig, it is still visible down to some 40 m, making these the clearest blue waters in the Atlantic Ocean. It is predicted that rising ocean temperatures as a result of global warming will alter the productivity and composition of marine phytoplankton communities especially in these ocean desert gyres. A rise in temperature will make the open ocean more stratified which will reduce the availability of nutrients. The dual effect of rising temperature and decreasing nutrients will potentially reduce the growth and productivity of the pico-phytoplankton, which in turn will make the ocean deserts expand. In these regions, the pico-phytoplankton may become fewer and the life that depends on them higher up the food chain will become reduced. Indeed, the crew who have been traversing these waters for decades, report fewer wildlife in these areas. According to some of the crew, back in the 1980s the Southern Gyre was teeming with flying fish, trigger fish, dorado, tuna, sharks and marlin. 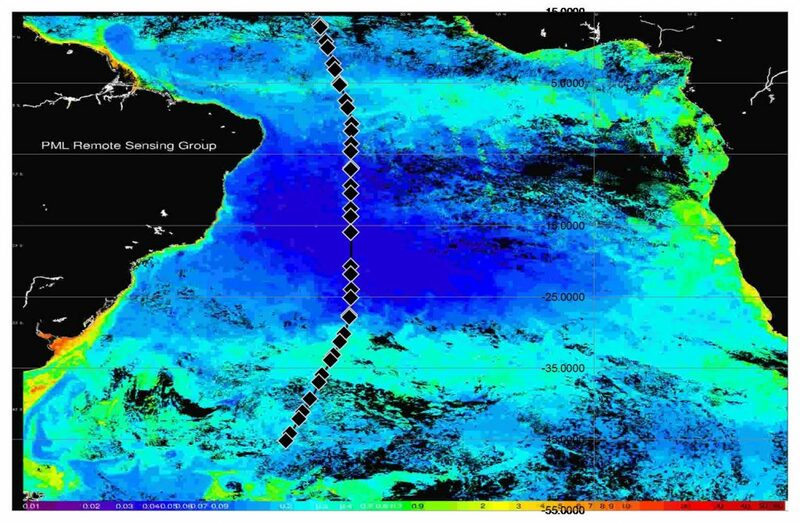 During this AMT4SentinelFRM voyage, chlorophyll-a in the deep Southern Ocean Gyre has been lower compared to previous Atlantic Meridional Transect cruises. We have also seen fewer animals and fish in this expanse of clear blue water. In a world of increasing carbon dioxide, the Tropics could be significantly affected as the organisms that dwell at these latitudes are pushed beyond their thermal tolerance as the temperature increases. 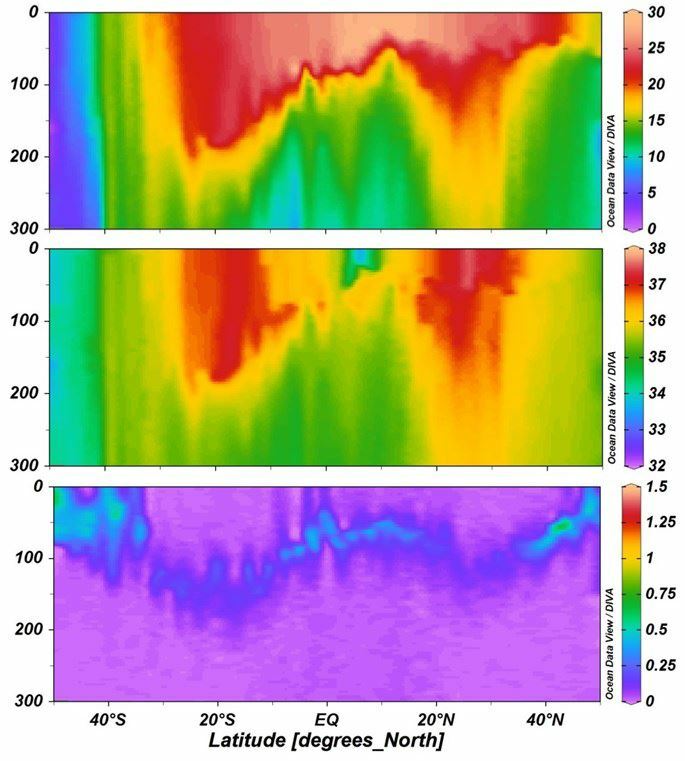 Temperature, salinity and chlorophyll-a (estimated from fluorescence) sections from Conductivity Temperature Device profiles during the second AMT4SentinelFRM voyage. The regions of higher and deeper temperature and salinity with deep, but low chlorophyll biomass represent the Northern and Southern Gyres (Arwen Bargery, British Oceanographic Data Centre). Through a concerted effort of the Sentinel validation community and projects such as AMT4SentinelFRM, the accuracy of Copernicus satellite products will be improved to facilitate the monitoring of state, health and potential expansion in a warming ocean, of these desert gyres. Paetra Tauchert on AMT4SentinelFRM: Hold on to your hats!